The closing paragraph of my review to Primordial's 2005 release "The Gathering Wilderness" expressed a wish: that this highly underrated extreme metal quintet would finally be provided with the necessary means to present their passionate and emotionally charged music to the world. Well, Metal Blade seems to be the only label in the band's history to have put in so much effort, not only in terms of promotion, but also in providing the band with the ideal environment, allowing the Irish bards to create their unique music - a strategy that has certainly paid off in the form of their new killer release "To The Nameless Dead". The main issue facing A.A.Nemtheanga (vocals) and Co was of ensuring that "To The Nameless Dead" would reach, if not surpass, the exceptionally high standards of quality achieved by its predecessor. 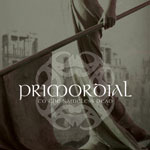 Though this would certainly be a very difficult, if not impossible, task for any average extreme metal band, Primordial faced the challenge with confidence and the result can only be described as the 'angry newly-born brother' of "The Gathering Wilderness". Yes, even though the long atmospheric interludes and dark Celtic-sounding melodies are still the backbone of each of the eight featured composition, at times, "To The Nameless Dead� celebrates the return of shredding riffs, double-bass drumming and Black Metal growls, all of which were greeted with great satisfaction by the author of this review. There is no better way to introduce a killer album than by using a rhythmical up-tempo composition, such as the first track "Empire Falls�. This eight minute Epic provides the listener with a list of the most important selling points of this release: a raw and dynamic sound, passionate vocals, adventurous drumming, a Slayeric-sounding melodic break and a catchy sing-along refrain which is guaranteed to stick in your mind for the weeks/months to come. Alan's vocals are as passionate and dramatic as ever, yet his technique seems to have improved noticeably during these last two years and the same applies to the remaining members of the band. Simon O'Laoghaire's (drums) contribution to the mournful atmosphere of "Gallows Hymn" is essential, creating not only the imposing main military-sounding theme of the song, but also the foundation that enabled Alan's vocals to express the feelings of anguish and anger that this powerful composition wishes to convey. Elements from the band's cultural origins are, as always, audible throughout this release, and are especially pronounced in "Heathen Tribes" - a composition whose opening acoustic guitar theme and tribal drumming conjure up images of young Celtic warriors engrossed in their last thoughts on the night before a great battle. Finally, those of you who still cherish albums such as "Imrama" and "Journey's End" for their aggression and dynamism will be blown away by the intensity of "Traitors Gate" - a seven minute collection of blastbeats, shredding guitar riffs and a variety of clean and throaty vocals, the power of which sweep away everything that stands in their way. I often wonder what the status of this band would have been had they been offered a real helping hand much earlier in their career, but maybe it is because of all the hardships that they had to suffer in the past that they are now in a position to write such powerful and emotionally draining compositions, such as the ones featured on "To The Nameless Dead". Ladies and Gentlemen, if you think that Primordial reached the peak of their creativity with "The Gathering Wilderness", then you'd better think again. There is a new 'Titan' out there - one that shows no mercy to the nonbelievers, so if you don�t plan on supporting these Irish noisemakers in their latest musical journey, then you�d better beware!